"Gene nt-Nha had 35% identity to the shaA (mrpA) gene of Clostridium tetani. 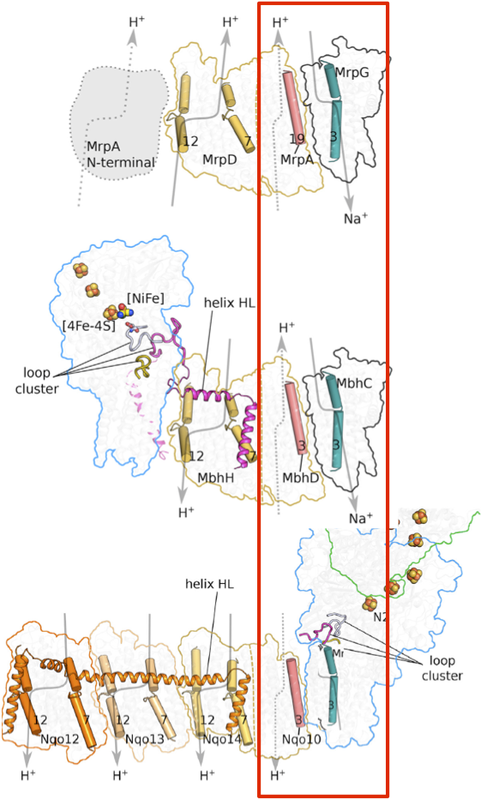 The Mrp proteins belong to the monovalent cation/proton antiporter-3 protein family....Sequence analysis of the regions surrounding gene nt-Nha, however, did not show that it was part of an operon. This indicates that gene nt-Nha does not encode a subunit of an Mrp system, but rather a mono-subunit antiporter". "A MrpA/MrpD homologue encoded by a “stand alone” gene from polyextremophilic Natranaerobius thermophilus was recently reported to exhibit Na+/H+ and K+/H+antiport activity in anaerobically grown E. coli KNabc (24)"
nt-Nha ~ An "MrpA/MrpD homologue". This is a just about acceptable per se because MrpA and MrpD are homologous to each other and nt-Nha is closely related to MrpA (shaA) of C tetani. But Mesbha herself never mentions MrpD in her 2009 paper or in her PhD thesis. And "MrpA/MrpD" is open to mis-interpretation. So we have "definition-creep" here, where nt-Nha could be accidentally seen as some sort of composite of MrpA in combination with MrpD. Ouch. "On the other hand, a fused MrpA-MrpD homolog in the alkaliphilic Natranaerobius thermophilus displayed Na+/H+ antiport activity when produced in E. coli strain KNabc (5, 28)"
Ref (5) is Morino's paper on B subtilis Mrp, in which one rather misleading citation suggests that nt-Nha is an "MrpA/MrpD homologue". This has developed to the extent that nt-Nha has now "become" a fusion of two genes to give a rather mythical monster. Ref (28) is just Mesbha's PhD paper in which nothing of the sort was suggested. "Send three and fourpence, we're going to a dance". 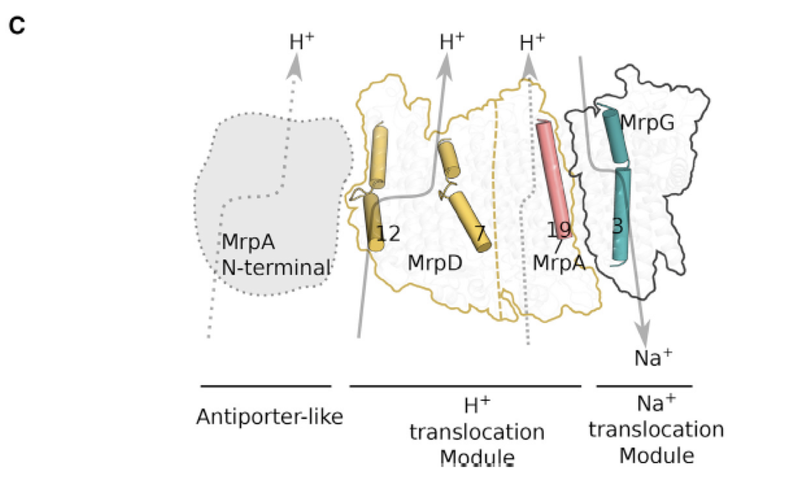 The chance of their understanding how nt-Nha or their very own archaeal MrpA subunit work as a stand-alone antiporter appears to be approximately zero. 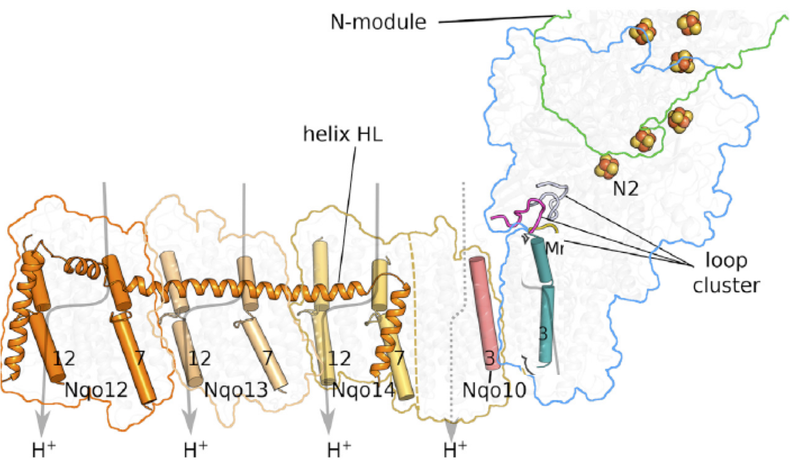 "The final model presents 13 transmembrane α-helices organized in a similar arrangement as the NuoL subunit". A factual association is probably true between being above the median in ability to do work on a specifically selected gym machine and longevity. What does this mean? It's observational. Hypothesis generation only. Perhaps non-athletes with higher power output might live longer because they have excellent mitochondria and our mitochondria are essentially what determine our longevity. Having good mitochondria might well mean that you exercise spontaneously without describing yourself as an athlete. As in I might carry a couple of sacks of chicken food myself rather than wait for Paul the yard-man and his barrow. But this is an effect, not a cause. Non-athletes with low power output may be the converse. They have mitochondria in which the cardiolipins anchoring their cytochrome-C to the mitochondrial inner membrane are as flimsy as a PUFA in a deep fat fryer, which are willing to trigger apoptosis at the drop of a superoxide molecule. Poor mitochondria, less muscle fibres giving sarcopaenia, shorter longevity. Probably already giving diabetes in-situ. An AHA poster-child. Taking someone from the second category and making them exercise might convert them to being healthy with a long life span. Maybe. Or, there again, it might make the gym sessions so unbearable that they quit. Or, if you don't let them quit, it might simply make no difference. Or, if you don't let them quit, it might kill them sooner! As Eeyore said "think of all the possibilities, Piglet, before you settle down to enjoy yourselves". Declaration: I have nothing against exercise. Nowadays I mostly boulder because it is three dimensional problem solving using muscle groups to failure on a regular basis. Plus I also try to keep my cardiolipins as saturated as practical! As always, the suspect antiporter is thought to be NuoL, the distal "antiporter-like" subunit. You can see the logic for this which is supported by the stand-alone antiporting homologues of NuoL seen in nt-Nha and at least one archaeal MrpA subunit. Personally I'm not sure this is the case. The phenomenal difficulty in trying to interpret exactly what is happening in a structure as intricate and as minute as complex I allows many views of the available data. 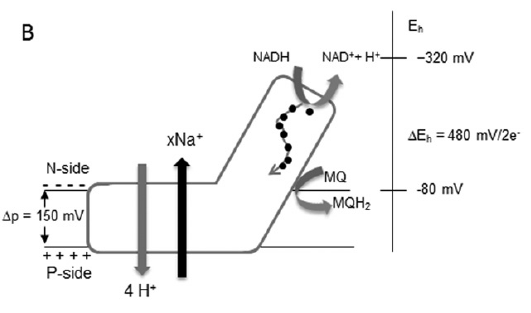 Respiratory complex I: A dual relation with H(+) and Na(+)? Because transferring two electrons from NADH to menaquinone only provides 480mV/2e- the complex uses Na+ moving down its concentration gradient to "top up" energy availability and so get the extra energy needed to pump the full four protons. Aside: The paper has lots of good ideas but they are very wedded to the concept that NuoL, M and N are still antiporters and that loss of "control" by the redox cytoplasmic arm allows this antiporting to re establish. It's a very reasonable idea but I think it can be improved upon, especially now we have more detailed information about the Na+ pumping of the P furiosus MBH, where this is not what has happened. End aside. Why on earth should it matter whether complex I pumps the full complement of four protons? If there is only enough Gibbs free energy for two or three protons, why not just pump two or three protons? What if you only have 480mV/2e- available, giving a half hearted "nudge" to the left when you need the full shove from 840mV/2e-? Is it possible that, under these circumstances, nothing at all happens? 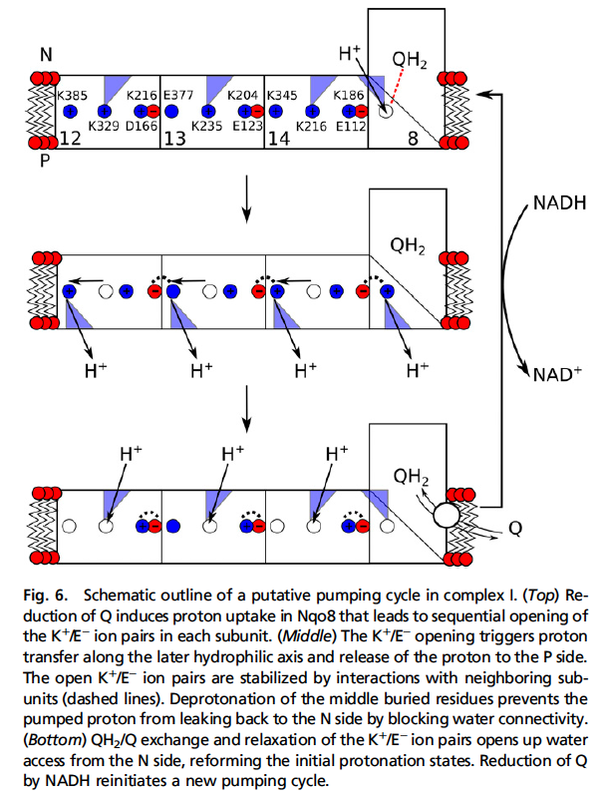 There is no flip of the glutamate/lysine pairs from together to apart, which triggers all of the opening/closing of water channels that allows proton translocation? Zero proton translocation? 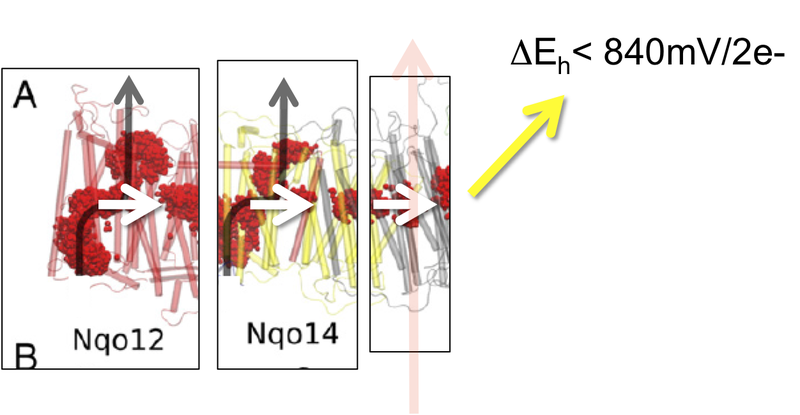 If you wanted to restore the full "kick to the left" it might be a reasonable energetic top-up to supply the extra energy from Na+ ingress up near the Q binding site to allow the menaquinone plus Na+ ingress to generate the full Gibbs free energy for activation of the membrane arm. That needs a trans-membrane channel, so we are looking at the really complicated region around NuoH and NuoA/J/K. Not easy. Might it be the Na+ channel I need? No one knows (yet). It is known that there is a conformational change in the region of the CoQ binding pocket when complex I changes from the active to the deactivated state, close to the region of the broken helix head. I would suggest this conformational change might allow the Na+ antiporting function to occur when pumping in complex I is deactivated. Protons would be allowed to enter the cell/mitochondrion in exchange for Na+ expulsion (theoretically reversible but that seems unlikely physiologically unless you are a bacterium using menaquinone where some Na+ ingress is worth it to trigger the membrane arm). Logic says that this trade off would be preserved if antiporting provided a net benefit to the organism under which ever conditions might have favoured deactivation of complex I.
Addendum. Here are the three complexes lined up. Because PowerPoint lets you do it. No other reason. It shows that taking two electrons from NADH and dropping them to CoQ provides a Gibbs free energy of 840mV for the pair. That's all well and good and is why cells love oxygen based electron transport chains. But I'd like to look at this in reverse. We know that complex I works perfectly well in reverse. So we can say that dropping four protons from extracellular to intracellular down a membrane voltage of 150mV across a proton tight membrane will allow the performance of 840mV of work. 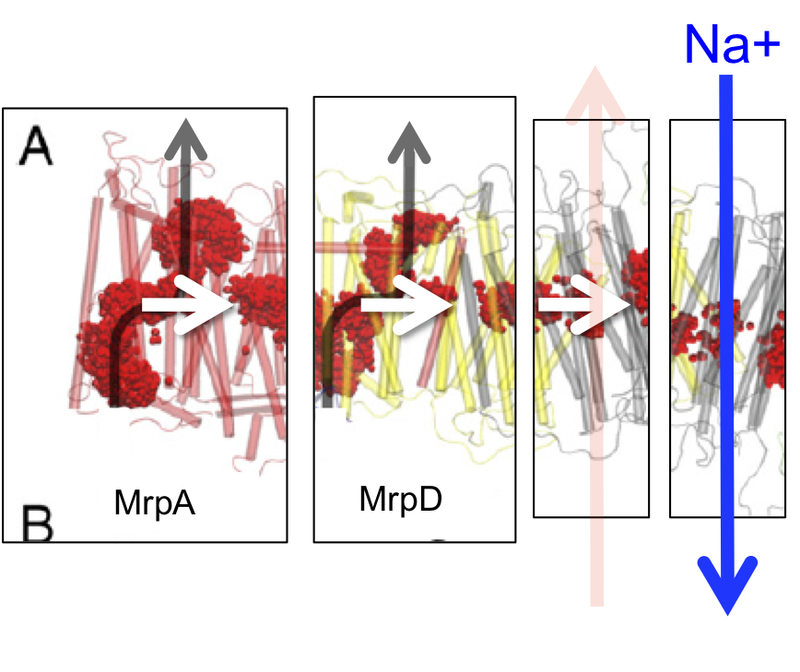 For complex I running in reverse this 840mV of work is always used for NADH generation from NAD+ (or superoxide generation) because that's the unit bolted on to the membrane arm. 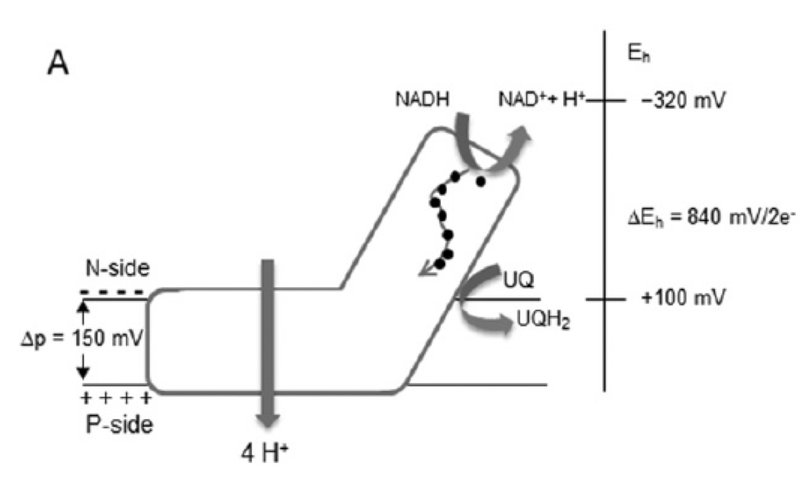 Other metabolic units can be used in place of NADH dehydrogenase and many of these can be found in various bacteria using various substrates with various numbers of antiporter-like subunits in the membrane arm. All will work in reverse and provide/utilise differing Gibbs free energies. So I would like to view the membrane arm of all of these complexes as a machine in its own right which, when running in reverse, can harvest the energy available from a proton gradient for whatever function the cell might like. Obviously this is not the current arrangement, but is possible. running in reverse to give 840mV/2e- of usable energy. 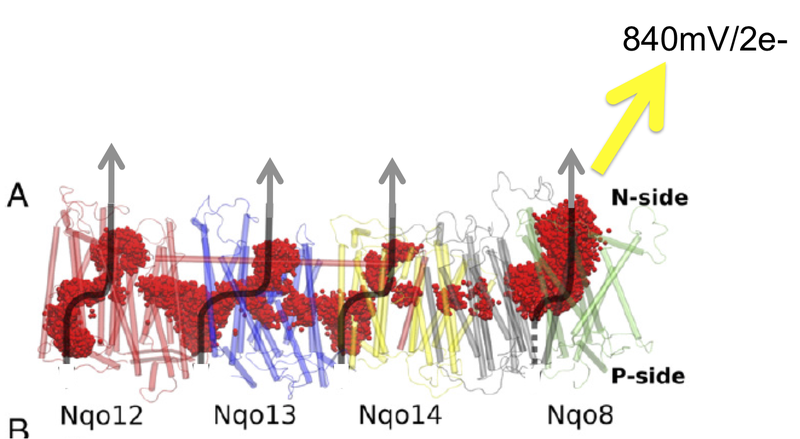 As in the last post we can imagine each proton passing through each channel "kicks" to the right ('cos we're running in reverse here) until the cumulation of four "kicks" is enough to cause the conformation change in Nqo 8 which drives two electrons back up the FeS chain to an NAD+. Think of the membrane arm as a machine to accumulate multiple "kicks" to give a big Gibbs free energy. Two proton translocations will provide much less Gibbs free energy than four proton translocations. I've faintly allowed a third proton channel but there is no suggestion this is a functional feature of complex I at all. It's Nqo 10, never mentioned in the paper. Note that all of the subunits are kicking in the same direction. where the energy of two protons is cumulated to allow a single Na+ ion to be extruded. How much of a Gibbs free energy will be developed by the two protons will obviously be influenced by the membrane voltage through which the protons fall. It will also be influenced by the permeability to protons of the membrane in which MRP is embedded. If the membrane was 100% permeable to protons there is no point trying to harvest a gradient which isn't there. The more permeable the membrane the less energy can be harvested per proton. But we do know that in E coli under CCCP with a membrane voltage of as little as 15mV that MRP can cumulate enough Gibbs free energy to antiport Na+ when monogenetic antiporters fail completely. In the ancestral hydrothermal vent scenario a membrane voltage from the pH gradient between vent and oceanic fluids might be, ideally, around 150-200mV. I still consider MRP is most likely an adaptation to allow colonisation of vent environments where apposition of fluids is not perfect or some mixing has already occurred and the available membrane voltage might be very low. Given MRP LUCA might survive on the edges of vents in addition to thriving in the luxurious conditions of perfect apposition near the centre. Notice that all of the "kick" arrows run in the same direction as for all of the illustrations in this post, looking to generate a significant Gibbs free energy at the right hand end. 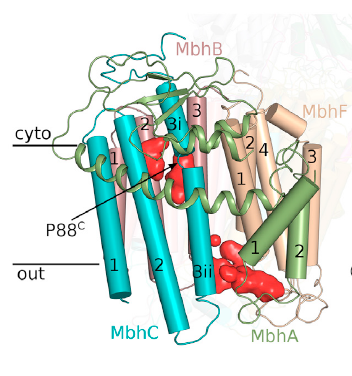 "A hydrophilic axis across MbhM membrane interior is also identified but it is separated from that in MbhH due to a gap between the two subunits"
"Note the large gap between subunits M and H in MBH (A). 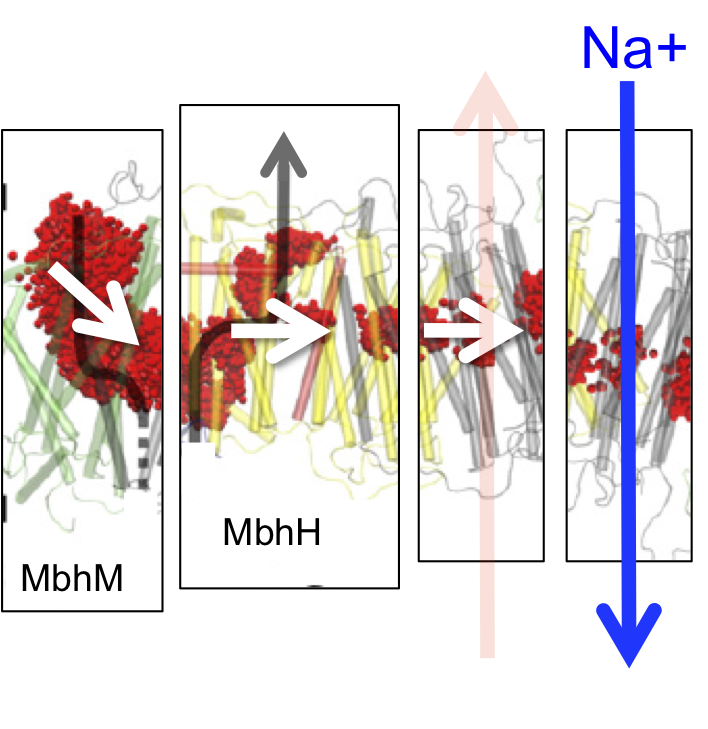 There are four elongated densities located to the lower region of the gap (A) inset; marked by blue dashed lines), which stack against several hydrophobic regions of subunits M and H. These densities are likely from two phospholipid molecules that may stabilize the structure and prevent ion leakage across the membrane bilayer. The dashed curves in (C) and (D) highlight the fact that the chain of hydrophilic residues found in complex I is continuous (D), but is discontinuous in MBH (C)". 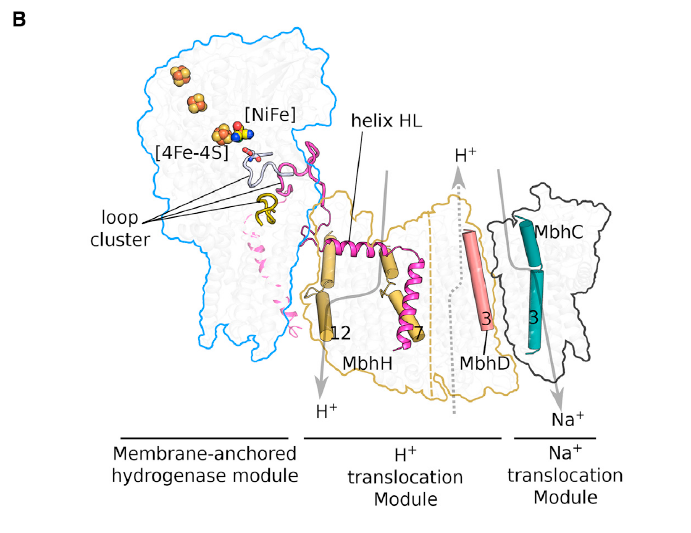 As well as stopping MbhM "kicking" the central water channel protons of MbhH to the right, the conformation change from the NiFe hydrogenase has to be imposed on MbhH to force a proton outwards. 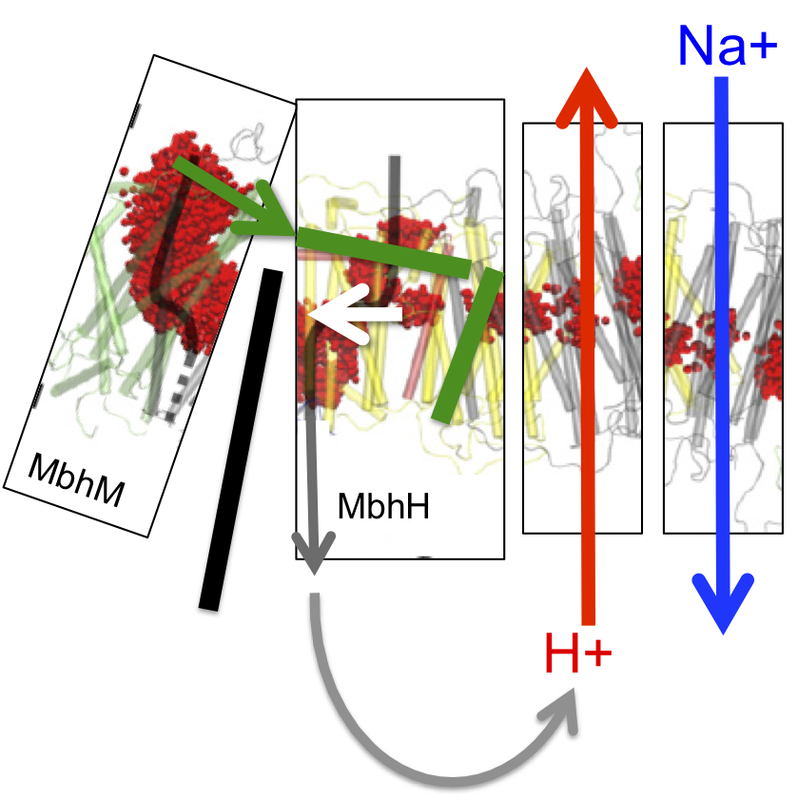 So the white arrow of proton "kick" in the central water channel of MbhH is reversed by the green cranks using the power from the hydrogenase (green arrow) to enforce this. 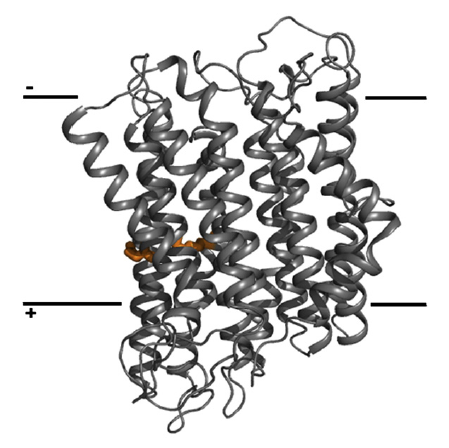 The bright red proton channel is present as specified by Yu et al and is both essential and functional. 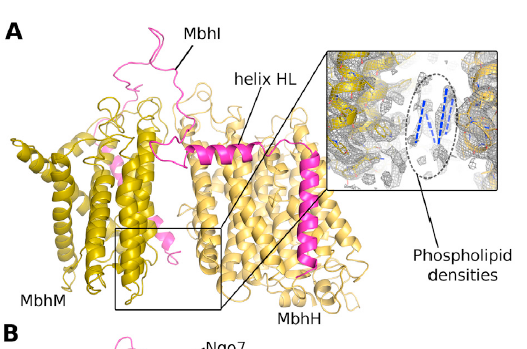 Quite what the remnant of this is doing complex I I don't know and quite what the proton channel within MbhM is preserved for I also can't imagine (yet). But the general principles of proton movement as set down here are much more satisfying than my initial thoughts on MRP and MBH. Because it's bacterial it is all labelled up in Nqo terminology. In mammalian complex I we use Nuo terms, where NuoH is Nqo8, NuoL is Nqo 12, NuoM is Nqo 13 and NqoN is Nqo 14. We can ignore all of the other subunits. If anyone goes through the diagram in the sort of detail I did they can see that Nqo13 doesn't make sense because glutamic acid E377 is not a lysine (K abbreviation), which it is in the other two subunits. That messes up all of the charge movements and the inter-subunit electrostatic binding. From Fig 1 section B elsewhere in the paper you can see there is an arginine (R163) just "north" of E377 which might be doing this job by binding to the aspartate (D166) of Nqo12 but I can't see that this is addressed anywhere in the paper. So it's just my guess. Still. The basic concept is pretty convincing. 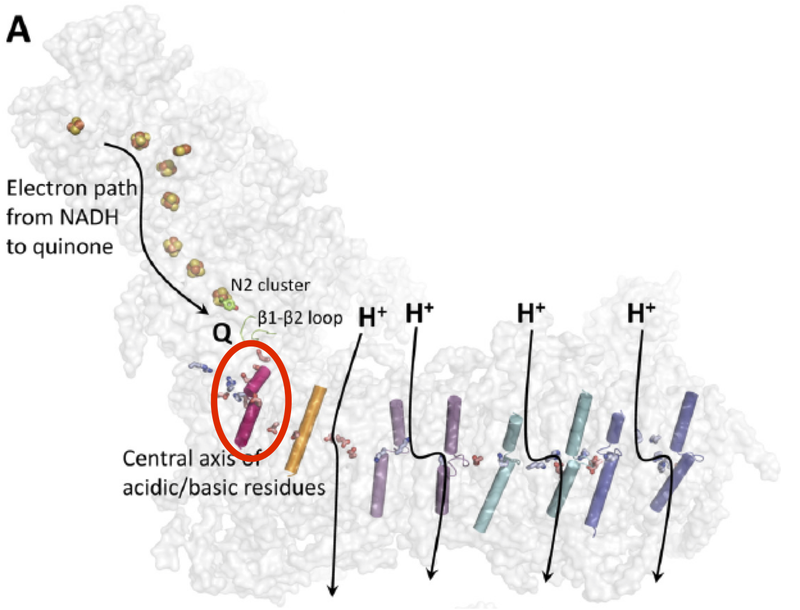 TLDR: The reduction of CoQ to CoQH2 clunks protons horizontally within the central hydrated channel of each antiporter-like subcomplex from their input zone to their output zone. We have to bear several things in mind. First is that the system is completely reversible today. As in reverse electron transport using a high membrane potential and reduced CoQ couple to reduce NAD+ to NADH, and generate ROS when NAD+ is all used up... Protons will move inwards from periplasm to cytoplasm as this happens. Also this is complex I, it is a relatively late addition to modern bacterial metabolism dependent on proton tight membranes and the availability of molecular oxygen. 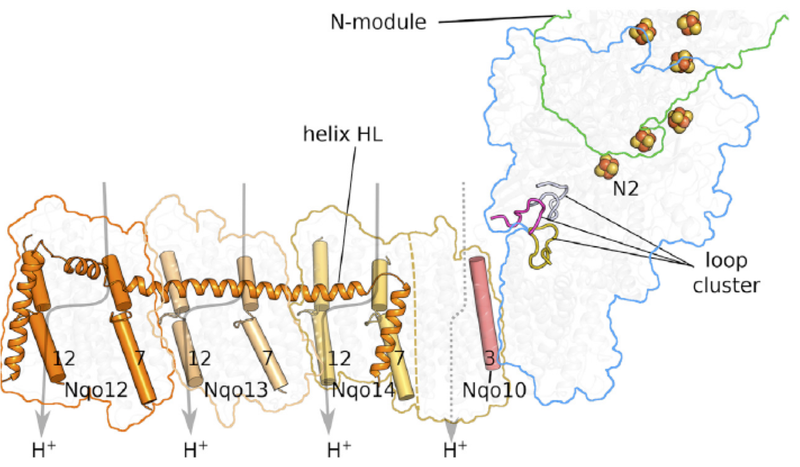 Third is that our best remnant of LUCA is the Na+ pumping membrane bound hydrogenase of P furiosus and this drives from left to right through an Nqo14/NuoN related subunit (and will almost certainly be equally reversible) to its Na+ channel. I have some Powerpoint doodles to take this a little further.